The Lex Art Sculpture from Main and Limestone - Lexington, Ky. This past weekend, the installation of Lex was completed over the Lexington Laundry Company Building at 141 East Main Street. Designed by NewYork sculptor Dewitt Godfrey, the design is a fixture of various shapes and sizes of steel tubes nestled between its taller neighbors. 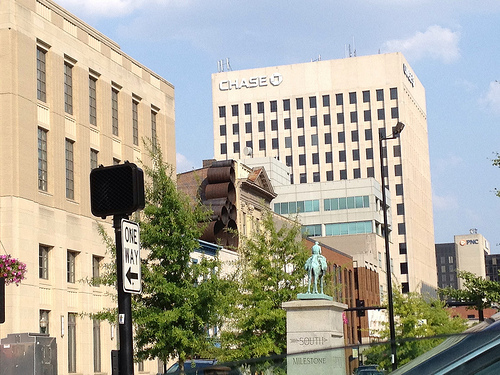 The work, which adds another dimension to a block that is already a mixture of historic and modern architecture was commissioned work by LexArts and Leadership Lexington's 2010 Class. This final design is scaled-back from the original renderings which also topped the neighboring Lexington Cigar Store. Another twist on Godfrey's well-known abstract steel tube design, the Lex project is unique in that its location is three stories above ground with no pedestrian access. The piece weighs approximately 11, 900 pounds and spans 18' 8" over the art center. At its tallest point, the Lex exceeds twenty-seven feet with its 17 cylinders. The largest of those cylinders is ten feet in diameter. Be sure to check out the new tubes o'er Lexington when you come downtown for the Fourth of July!! Modified from an earlier post.